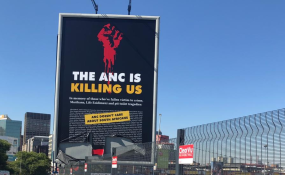 Cape Town — According to EWN, a billboard commissioned by the Democratic Alliance (DA) that features a list of names of victims in the Life Esidimeni tragedy and the Marikana massacre has been amended to feature a new message - "The ANC doesn't care about South Africans". This comes after the controversial display, which was vandalised after its initial unveiling in the Johannesburg city centre, sparked a public backlash from some of the family members of the deceased, writes The Sowetan. The DA stood its ground despite the retaliation with representative Mabine Seabe saying the party is sticking to its message. "We have a government that refuses to compensate families who lost family members during Life Esidimeni, during Marikana, during the pit latrine incidents." According to Jacaranda FM, spokesperson for family members of the Life Esidimeni deceased, Christine Nxumalo, the DA did not consider the emotional toll the campaign would take on the families of the victims. "They did not consult us or even discuss or inform us or let us know that they were going to be doing this. What makes it sad is they could go as far as printing out names on a billboard. In all the years that I have been living never have I seen names of deceased people, especially through a tragedy, printed on a billboard." The message forms part of the DA's stance against the ANC's "murderous" 24-year reign. "The names on the billboard are a representation of the people who have died. This ANC government doesn't care about fighting crime because this year they will spend R2.6-billion on VIP protection. The ANC doesn't care about crime. The DA is here to take the fight to criminals. We care about the protection of citizens and not the elite," DA Chief Whip John Steenhuisen said.